2nd floor of the library: 6 are on the perimeter. The 7th is near the top of the stairs in the glass-enclosed study room. 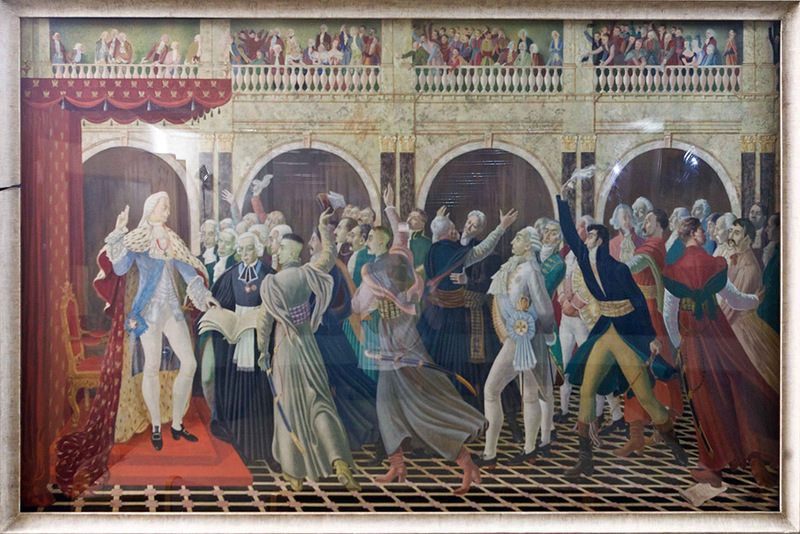 The seven paintings on Polish history by The Brotherhood of St. Luke were commissioned for the Polish Pavilion of the New York World's Fair in Flushing Meadow Queens, 1939-40. Their display together with the Szymanski tapestries and other prized cultural and historical items constituted the Polish Pavilion's Hall of Honor, the centerpiece of Poland's iconic towered pavilion designed by Jan Cybulski and Jan Galinowski. 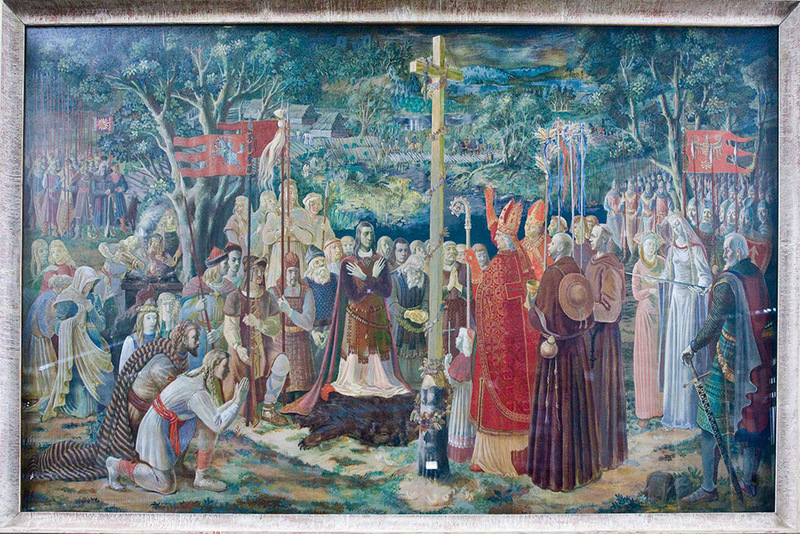 Holy Roman Emperor Otto III (980 – 1002) made a pilgrimage to Gniezno, Poland to the tomb of St. Adalbert (born Wojciech or Vojtěch and Bishop of Prague) who was canonized in 999 as the first Polish saint. 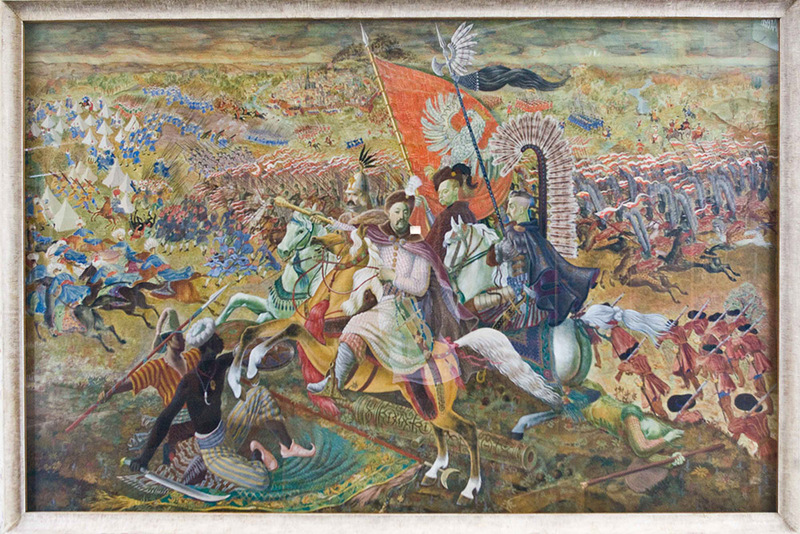 He was met by his ally against the Western Slavs, Polish King Bolesław I. The Emperor gave the King his crown and the King offered a replica of his Holy Lance in exchange. 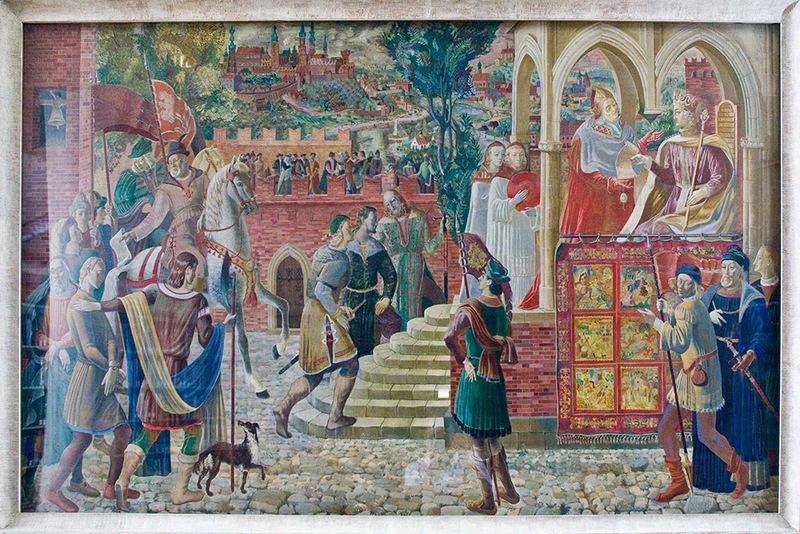 Otto III made Gniezno the first archdiocese of Poland and established three subordinate dioceses, thus establishing the Roman Catholic Church in Poland. 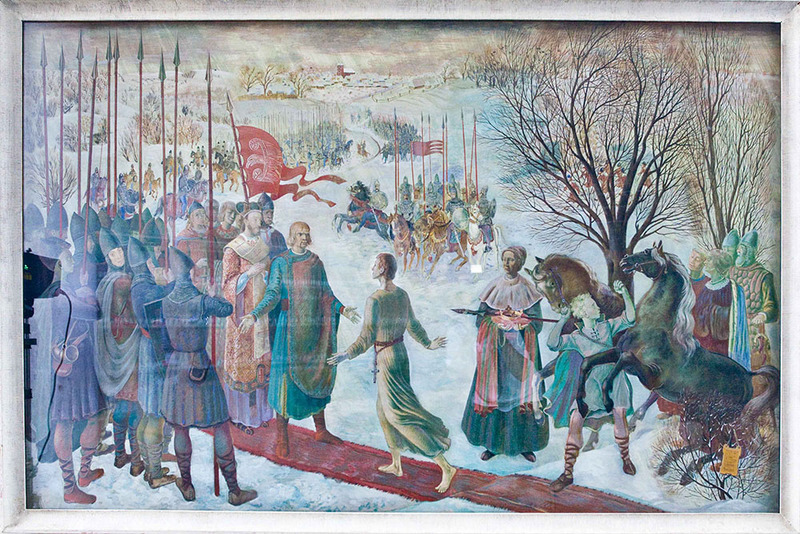 King Bolesław's entourage shows signs of Scandinavian influence in the arms and the garb of the bodyguard and of Byzantine influence in the vestments of church dignitaries. Queen Jadwiga of Poland (1384-1399) was betrothed to a Habsburg duke who was to succeed the emperor of Austria. However, the Grand Duke of Lithuania, Jagiełło (1362-1434), asked for her hand in marriage, promising to espouse Christianity to all his people. His baptism took place at Wawel Cathedral in Kraków and their marriage three days later. Thus Lithuania was converted to Christianity and the joint state was among the largest of Europe. Upon Jadwiga’s untimely death, Jagiełło reigned as King of Poland for 35 more years. The castle compound of Vilnius, Lithuania (Wilno) is shown as it believed to have appeared in the late 14th century. King Władysław Jagiełło (1362-1434) is liberating the serfs in Krakow, then the capital of Poland, in 1430. This Privilege of Jedlnia stipulated a writ of habeus corpus by which no member of the landed gentry could be imprisoned without a court-ordered warrant. Neminem captivabimus nisi iure victum ("We will not imprison anyone except if convicted by law"). This revolutionary innovation in civil liberties gave Polish citizens due-process-style rights that did not exist in any other European country for another 250 years. Originally, the right was restricted to the nobility (the szlachta), but it was extended to cover all residents in the 1791 Constitution. The Wawel Royal Castle is in the background. Sigismund II August, King of Poland, the last of the Jagiellonian dynasty and childless, formalized the merger of the two states of Poland and Lithuania, though each retained substantial autonomy, having its own army, treasury, laws and administration. What was accomplished though the marriage of Jagiełło and Jadwiga in the 14th century was now a formal interstate agreement. 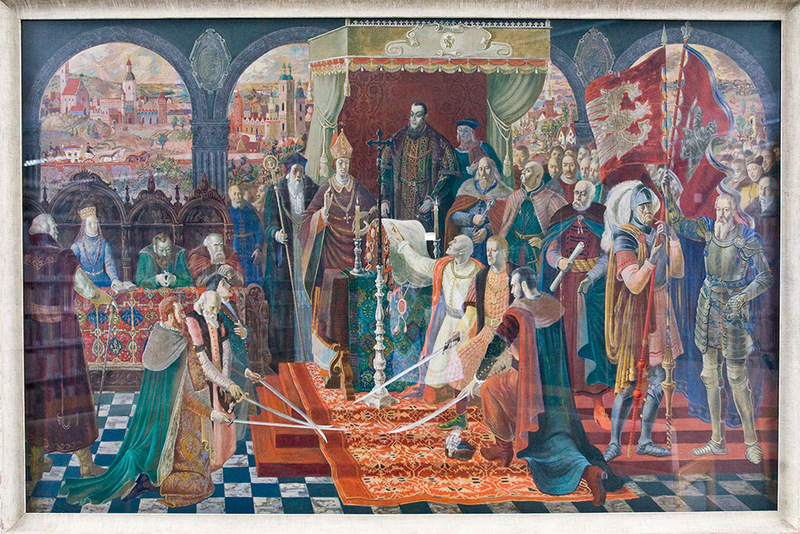 A single ruler was to be freely elected by the nobility of both nations and coronated as King of Poland and Grand Duke of Lithuania at the Wawel Cathedral in Cracow. Parliaments were to be held jointly in Poland. 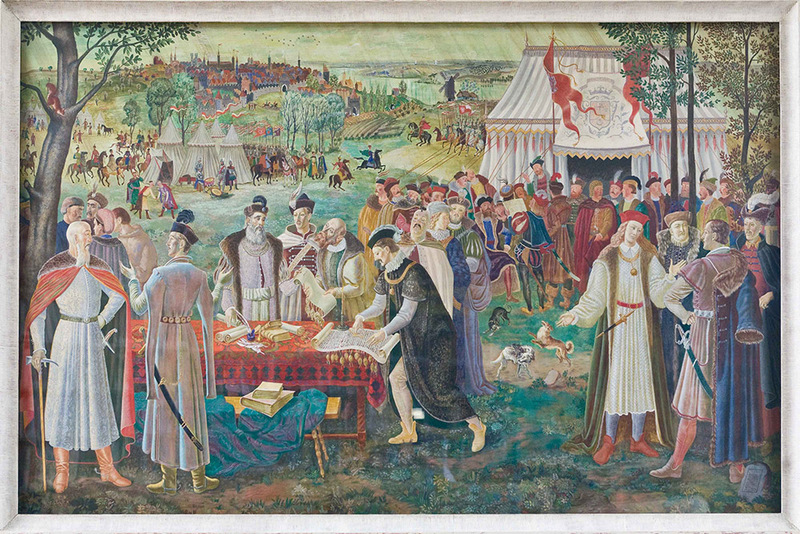 The granting of the freedom of religion in the Polish-Lithuanian Commonwealth, the first such document in Europe, came in 1573 as Polish citizens representing different faiths promised each other mutual tolerance. All subsequent kings acceding to the throne were obliged to swear allegiance publicly to this act of tolerance. The names and seals of the signatories of this act permitted researchers to locate contemporary portraits of all but one of the group. Thus, with that one exception, all faces in the painting are portraits. Jan Sobieski, King John III of Poland, led the allied forces of the imperial troops of the Holy Roman Empire, Saxony, Bavaria, Baden, Franconia and Swabia, against the Ottoman Empire. Sultan Mehmed IV sent his grand vizier Kara Mustafa Pasha and his army for yet another massive military campaign against Europe and the Hapsburgs. The Ottoman troops attacked the walls of Vienna by tunneling underneath. Sobieski and Holy Roman Emperor Leopold’s brother-in-law Charles of Lorraine led the armies of some sixty thousand men that split up and took by surprise a contingent of Kara Mustafa camped at the outskirts of the city. Sobieski led his “winged horsemen” and their deafening sound in what was a decisive charge againt the encamped Kara Mustafa and his men who fled, thus preserving Christendom for Europe. A democratic constitution was voted by the general assembly, the Sejm, on May 3, 1791. This was a voluntary act by the privileged classes that limited their own rights and raised the status of the depressed classes to their own. The constitution defined the prerogatives of the legislature, both the judiciary and executive powers respectively. Present are Prince Józef Poniatowski, nephew of King Stanisław August Poniatowski. The Polish-Russian War followed shortly after, leading to the second partition of Poland by Russia’s Catherine the Great and Prussia in 1793. Property of Le Moyne College. Photography by Charles Wainwright.